We ran two stories several months back featuring the independently developed Hawken. 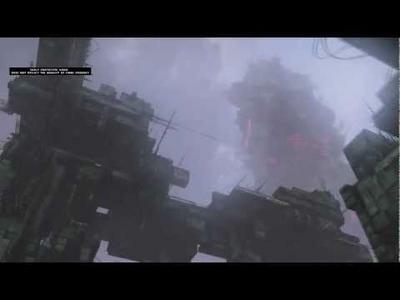 The first featured a trailer with three minutes of gameplay footage of this first-person mech title. That second story was all about the type of intensity that boils up from an in-cockpit, realistic, mech experience much like Hawken looks to provide. The last piece ran during the beginning of April. Since then, Adhesive Games, the studio behind the title, has been relatively silent. They earned some buzz at E3, but then stepped back to work on their project. Today brings the newest bit of media for Hawken with the nearly two minute long story trailer. We would have been more comfortable with calling this a "setting" trailer, as there isn't much story shown at all. That part of the game is still shrouded in mystery; which is our way of saying "unannounced." What players will see, however, is a few seconds of in-game combat as well as a ton of epic panning around Hawken's environments. This clips sets the mood for mech carnage, if nothing else. Adhesive Games posted a link to the trailer above on their blog. Within that post, the studio indicated that they would be releasing another trailer within the week. We'll be sure to cover that once its live. As far as I'm concerned, a new, strong mech game is always a welcome addition to the action themed world. If Hawken continues on the apparent path of epicness, sign us up. While no release date has been announced, Hawken is currently being planned for the Xbox 360, PlayStation 3 and PC.